i was so in love with my first kaleidescope from china glaze, kaleidescope him out, that i had to get my hands on a few more. this is visit me in prism, a lavender-ish holo sparkley gem that is soooo lovely and set the sun bouncing off my tips wherever i went. 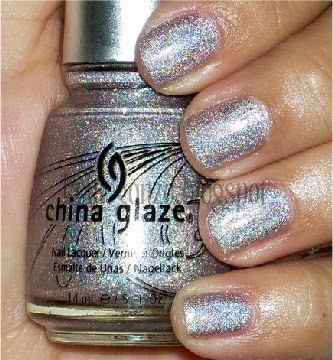 the thing i love about these polishes is that they look holo even indoors, unlike some other collections. 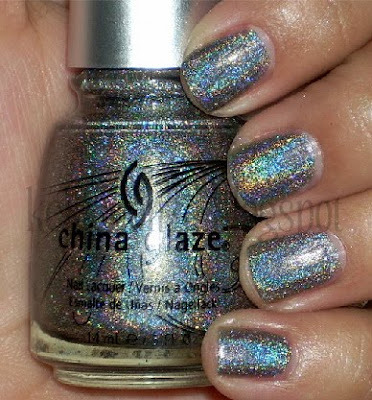 the second one i got was let's do it in 3d which is a dark grey/coal holo that is awesome awesome!! i am convinced this is the greatest holo known to man. i'm in utter love with this guy! both of these polishes apply super super SUPER easy as well, these were 2 coats i believe.